Golf Story's clever writing and sound golf fundamentals keep it entertaining, even through some stale moments. Despite its light-hearted RPG structure, there's a challenging and very real golf game here that's worth coming back to even after the story is over. But it left me wishing that more of the campaign focused on the golf itself, and less on the often repetitive side tasks. Mario Golf and Earthbound combine for one of the most delightful games you'll find on Nintendo's Switch. A fantastically charming mix of golf sim and role-playing game, that smooths over its rough edges with its irreverent humour and wild imagination. Sidebar Game's charming golf RPG hits it out of the park. Even though Golf Story isn't quite what I expected it would be, it is an absolute delight. It's more than just a golf game with RPG mechanics, but it's not quite a full RPG with golf mechanics either. It lies in a sweet spot in the middle, where people who care about one but not the other can still get into it. I can't stop thinking about this little indie sports RPG – and it deserves the attention. A golf game with an interesting story and some good variations that keep changing the classic formula. Sidebar Games brings Nintendo Switch users a great RPG adventure camouflaged in a golf game. Fun, quaint and a bit buggy, Golf Story is a lovely but flawed distraction. Golf Story is confident, smooth, and its lighter than light approach to everything from art to humor to play is perfectly matched with the Switch's play anytime, anywhere form factor. Forget the agony and ecstasy of real golf. This is a really good time. Golf Story is held back by a number of mechanics, some of which are not very fleshed out or enjoyable, the occasional glitch, and lots of quests which require skill and control of the game's often shaky mechanics. The story is entertaining enough, but the real charm of this game is the hilarity of its characters characters and dialogue. This really is a must have for any fan of golf games, but as an RPG fan, I thought this indie title only came in at par. Even if Golf Story does not manage to make it big, it doesn't fall flat on its face either. It may lack variety and be too long with a plot that doesn't quite captivate but Golf Story still gets it right when it comes to content, challenges, secrets and minigames, while its multiplayer is a pleasant surprise. It may not hit a birdie but it reaches a par. 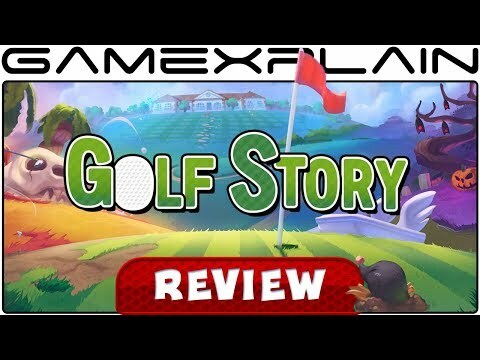 Fun, diversified, generous and also technical, Golf Story synthesizes two great gameplays to deliver a love story between golf and classic RPGs. With great dialogues and a hardy direction, the game offers a decent amount of courses, even though it may lack some real challenge in the end. A very interesting Golf RPG. Crazy mechanics, crazy story and crazy NPCs. A fresh game. The plot in Golf Story isn't the most gripping or complex, but its world and characters simply ooze with so much charm it's hard not to fall in love with it. Though the gameplay mechanics on show here might not be as deep as you'd want from a proper golf game, Golf Story is still a wonderful delight to play from start to finish, and it's a gem of an RPG that Switch owners shouldn't skip out on. Golf Story is a good enough golf game in it's own right, but combine that with a great script and RPG mechanics and it's packing more than enough to stand out from the crowd. All told, Golf Story is a surprisingly gripping game, hooking you with fantastic gameplay, loads of content, and a well-written script. This is one that'll have you coming back for many hours in the story mode alone, and the multiplayer does a good job of expanding on this with even more replayability. We would highly recommend Golf Story to anyone looking for something a little different. There's a whole lot to love here, and if you're a fan of RPGs or golf games, this is a must buy.